We had had more than enough of the estuary and our plans had always included cutting off the Bideford loop and taking the ferry from Instow to Appledore. But we had discovered it was not running at a time we could travel. Onto a bus then and round the Bideford loop which we promised ourselves we would come back and do as a day walk. After the usual lurching and swaying ride we disembarked in a vast car park in Appledore. Looking across the water we could see, just over a mile away, the route from Braunton we had taken more than a day to cover (and of course the White House). We picked up our rucksacks and continued through Appledore where the older, western part of the village is as pretty a place as you could hope to see and is a little reminiscent of the fisherman’s cottages at St Ives which have been taken over by artists and holidaymakers. Out of Appledore, following roads and the course of a river, and we hit a difficulty as the previously clearly-marked field-edge path disappeared into a thicket of brambles and started collapsing into the sea. With extreme difficulty we forced our way through about a hundred yards of dense and overgrown vegetation (the stuff at throat-height seemed to be mostly brambles, while the nettles clustered at ankle level) only to discover at the other end that we should have been on the beach all along. The path had been diverted and our route had been steadily reverting to nature for years. If there had been signposts, we hadn’t spotted them. Leaving Appledore and its outlying settlement behind it was time to head out for the Northam Burrows nature reserve which has been thoughtfully marked with a large recycling centre but is a very lovely place nonetheless. Northam is the real name of the resort known as Westward Ho! and the salt marshes gradually give way to a pebble ridge and sand before becoming a long stretch of wide, sandy beach. The trip through the Burrows has plenty to divert the walker including wild ponies and golfers from the nearby course slicing their balls off into the sea. We told ourselves lunch lay in Westward Ho! and set off along the beach. In ten minutes’ time we would be in a nice cosy chip shop or tea shop. Wrong. The beach is deceptively long, although thankfully firm underfoot, and for a long time the settlement at the far end seemed to stubbornly get no nearer at all. Forty minutes later we reached the boarded-up entertainments which line the edge of the beach and five minutes after that were sitting down in front of our plates of chips. Westward Ho! had the peculiar air of an out of season holiday resort closing down at the end of the season. It has very little which is not aimed at the tourist and therefore is open in late September when we passed through. It does have, on its western edge, some of the smartest public lavatories ever seen in a holiday resort with fresh flowers and potted plants, a tourist information display, the radio playing and an attendant. A visit to them is definitely recommended. After sampling the diversions of Westward Ho! it was time to get back on the path and head out for Bucks Mills which was our destination for the night. We could have pressed on for Clovelly but our experiences with misjudging distances the previous year had made us wary and Clovelly seemed like a good place to end the walk. We had also been warned darkly by telephone of the deceptive length and undefined horrors of the Hobby Drive, which marks the last few miles into Clovelly. So we were booked into a Bucks Mills B&B with a short stroll planned the next day to end things. The walk from Westward Ho! 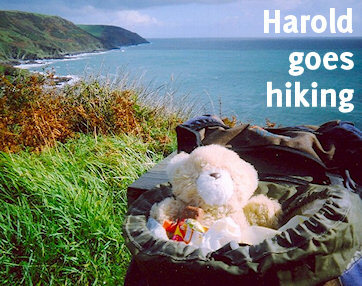 to Bucks Mills is quite strenuous and is a foretaste of what is coming after Clovelly when you round the corner at Hartland Point and get on the rollercoaster of the north Cornish coast. But it is also one of the nicest parts of the coast path in this area and, coming as it does after the slog of the estuary, it is great to be up on the cliffs again. The sun had come out again after the grey skies of the previous day and we left Westward Ho! past holiday chalets, caravans and finally beach huts before passing a deserted, derelict, almost Gothic house on the water’s edge. The path follows the old Westward Ho! to Bideford railway line for a while and so is wide, flat and easy to find. It soon begins to climb and the cliff edge falls away leaving rocky remains below constantly washed by lines of breakers and throwing up spray. The path follows the edge of fields on its landward side as it climbs Cornborough Cliff, Abbotsham Cliff and Green Cliff and dips into tiny coves and pebbled beaches which make the perfect place to rest before climbing back up to the cliff tops again. On one beach we had a snack and lay back in the stones and the sun in a blissful daze, unaware of the effect the sun was having on us. The climbing is fairly hard going here (cue a knowing laugh from those who have walked between Hartland Point and Padstow) but is worth every minute of effort. We had made good time in the morning and had the best of the afternoon and early evening sun as we crossed Westacott Cliff and Higher Rowden before dipping down to sea level again. So much so, in fact, that Lisa had far too much of it and was made to put on a hat while she could still recall what her name was. At Peppercombe the path dips into shady woods for a deceptively long walk into Bucks Mills when once again you cannot see any further than the trees surrounding you and it is hard to tell if you are making any progress. Also the path had been diverted slightly so we spent a long time looking for a turn which did not come. At Peppercombe we stopped for a snack and were delighted when a black and white dog belonging to a young National Trust ranger came up to say hello. His owner soon followed hoping to get into his Land Rover and drive away but the dog was quite happy as he was and was having none of it. What followed was pure pantomime as the ranger opened first one door then the other in a bid to get the dog into the vehicle (and to stay there) but he was outsmarted every time. In the end he had to drive a short distance down the track, as if leaving alone, before he could persuade the animal to go with him. The last we saw of them was as they turned round and drove off with the dog sitting in the passenger seat with his ears cocked, looking rather pleased with himself. Down a steep path and we were out of the woods and into Bucks Mills. With our usual skill we had managed to pick a B&B some distance from the path. It was 7pm and the owner had been a little worried that we were destined not to appear. “Here we are” we said, she agreed, and showed us up to our room which was the frilliest room imaginable and had little lace doilies everywhere – even in the shower. However some domestic tensions were evident and we decided discretion was the better part of valour and went out for our dinner. Near the harbour is an eating establishment called The Old Mill which acts as a tea shop during the day. But in the evening it becomes a sit-down restaurant apparently due to the owner’s love of cooking. There is limited table space and quite a small menu but the food was delightful. We had asparagus soup, pasta with a delicious provencal sauce and the obligatory sticky dessert as well as splashing out on the pleasure of a bottle of wine with our meal. It was an absolute treat to find such nice, restaurant-standard food in a place where we were expecting a bar meal at the best. We also had the fun of people-watching while we ate as a demanding family of four with two precocious children called constantly for attention. We were in no hurry to get back to the B and B under the circumstances and we were right as the domestic situation was, if anything, tenser. So we sneaked up to our bedroom, locked the door after us, and sank down into the frills to sleep the sleep of the well-fed.